Kilmarnock boss Steve Clarke has accused the Scottish Football Association’s judicial panel of prejudging Gary Dicker’s red-card appeal because referee Willie Collum is taking charge of Sunday’s Old Firm game. Clarke was confident of overturning Collum’s decision to send off midfielder Dicker for his challenge on Hearts midfielder Callumn Morrison at Rugby Park last week. However, an independent tribunal upheld the “serious foul play” charge at Wednesday’s fast-track tribunal and Dicker will now miss away games against Aberdeen and Hibernian. Collum, meanwhile, will take charge of the keenly awaited match between Celtic and Rangers at Parkhead. Clarke read out a prepared statement at his pre-match press conference ahead of the Ladbrokes Premiership game against Aberdeen at Pittodrie on Saturday and would say no more on the subject afterwards. The statement read: “I have to say that I’m disappointed but not surprised by the decision of the confidential panel, who chose to ignore our appeal and back the referee’s original decision. “An appeal process that excludes the people involved, namely the player, the referee and officials of the appealing club from putting forward their case face to face with the adjudicating panel will sometimes be open to strange and inconsistent outcomes. “This panel will usually be made up of three people and will, in all probability, include no former players, coaches or managers who understand football and the decisions that are made within a game. “My belief and that of the majority of people with a good knowledge of football would say that Gary Dicker’s tackle was a genuine effort to win the ball without malice or recklessness and with minimal contact on an opponent who proceeded to roll around as if seriously hurt only to get straight back to his feet on the issue of the red card. “The period of time between the tackle and red-card decision was ridiculously short and lacked a calm and rational approach from such an experienced official. “I don’t want, or need to, go through recent instances where red cards have been rescinded or downgraded on appeal or where violent conduct on the field of play has been overlooked by officials because they are there for everyone to see. Maybe smaller clubs like ourselves are fair game. “However, as I said at the start, I’m in no way surprised at the outcome of our appeal. 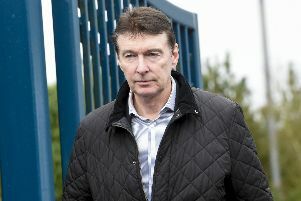 “As soon as I heard the news, very early in the week, that the referee in question had been appointed to take charge of the first Old Firm match of the season before our hearing had taken place I, and many other people, knew that the decision would go against Kilmarnock. The SFA has been contacted for a response to Clarke’s statement.